Leading members of the House Freedom Caucus, a group of roughly three dozen House Republicans who can block GOP leadership on key legislation, discussed the Trump administration's current plans on tax reform, the debt ceiling, reconciliation and more in a breakfast with Bloomberg's Kevin Cirilli this morning. Rep. Mark Meadows said: "I think theres going to be a rebellion against everybody, not just leadership... If we get to December and we've not repealed Obamacare, don't build the wall... it's not going to be pretty." "We're all surprised at the 3-month deal on the debt ceiling, it's nothing that any of us advocated for," said Meadows. "There was never going to be a clean debt ceiling. There was either going to be a Democratic fingerprint on it or a Republican fingerprint on it...yesterday it was dictated by the Democrats." "We're being dictated by the Democrats while they're in the minority," added Perry. 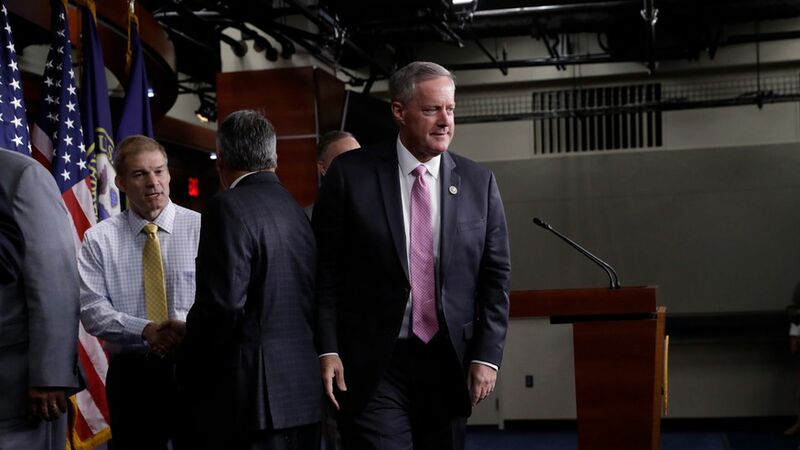 Meadows later said that if the Freedom Caucus had their way, the continuing resolution would've been extended into January, not December when Congress already has enough on its plate. Meadows said the Freedom Caucus doesn't have a legislative text "at this point" for a tax plan, but they have been discussing several ideas for their own version, and will be at the White House today to discuss it. "We have rates, we have principles, we have a little bit more specifically than leadership," said Meadows. Meadows added that they don't plan to actually pitch their own plan, but want to at least "put it out there" to start the debate, something Meadows said the administration has failed to do. Perry said the Freedom Caucus would prefer to make a debt ceiling deal on the 2017 reconciliation now, so that only the spending bill lands in December. "I think theres one shot at this," said Meadows, adding that reconciliation instructions "don't need to be mutually exclusive... we don't have to wait until December 2017... let's do longterm debt ceiling in September so we can pass [it] in the next couple of weeks... Is it a tight time frame? Without a doubt. But I think its malpractice [to wait until December]."